Common English name: tarragon, silky wormwood. Sometimes mistakenly called “mugwort”, which may be mistaken for mugwort (Artemisia vulgaris). Etymology: The word derives from esdragón, which in turn comes from dracunculus and means “little dragon”. – Italian: Dragoncello, assenzio, estragone. Synonyms: Dracunculus hortensis, Tragum vulgare. Origin: native to Central Asia, Siberia, Mongolia and Pamir mountain range. It was introduced in Europe in the Middle Ages. Habitat: It does not grow spontaneously, reason why it took quite a lot to be extended throughout the Mediterranean region. It rarely appears in the wild, but it is cultivated in orchards and gardens. Geographical distribution: spread throughout Central Asia. It is cultivated in Asia Minor, Central Asia, Central Russia, Central Europe, North Africa and the Americas. Tarragon (Artemisia dracunculus) is a perennial herb, 60 to 80cm. high, rarely found wild in nature. Tarragon is formed by short rhizomes, forming dense mats and numerous herbaceous stems. Can form colonies of up to 2 meters wide. 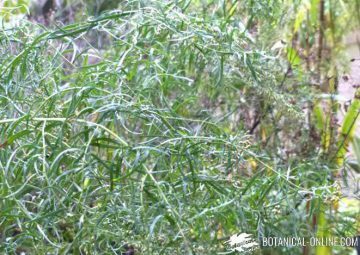 Leaves linear-lanceolate, entire (unlike other plants of the genus Artemisia), sessile, dark green and hairless, they give off a strong odor. The basal leaves are three possible lobulations at apex. The inflorescence is a globose floral chapter, with small flowers. Flowers greenish-yellow, about 3mm., Pendant, pistillate and bisexual. The plant flowers in June and July. The fruit is an achene. However, flowers are sterile in warm weather. This plant does not produce fruits in the southern areas. Its multiplication occurs from stem cuttings. – Fresh leaves: fresh young leaves are used as a herb. When the plant is dried, it loses some properties and aroma. To prepare sauces, salads, herbs and vinegar and some special mustard sauce. – Floral chapters: they are used as a spice. – Essential oil: used in aromatherapy, perfumery and flavoring additive (primarily liquor). – Artemisia dracunculus: species studied in this article. This plant is more interesting as a seasoning or herb. Glossy, narrow and elongated. Known as French tarragon. – Artemisia dracunculus var. indora: variety of tarragon leaves narrower and milder flavor than the last. Some consider it a species and not a variety of tarragon. This plant is more robust and easier to grow, but its taste is bitter. It is called Russian tarragon. – Artemisia arborescens: a shrub with silver foliage. – Artemisia abrotanum: lobed leaves and lemon scent. – Artemisia absinthium: divided leaves and very bitter taste. Plant more popular as a medicinal remedy, known as wormwood. – Artemisia ludoviciana: willow-like leaves, a beautiful silver color that is used for ornamentation.